Join the Port Moody Heritage Society! Memberships now more affordable than ever! Buy one for yourself! Buy one as a gift! 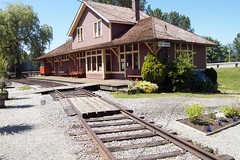 Become a part of the society that runs the Port Moody Station Museum. The Port Moody Heritage Society welcomes new members to become a part of it. Your membership helps support the operation of the museum and other projects of the society. You also can have a say at the Annual General Meeting in the Spring of each year and the election of the Board of Directors and Executive. Memberships start at $5 Canadian. Donations to the museum are always gratefully accepted. Tax receipts are provided for donations over $25 or by request.